In the perfectly designed restaurant, there is just the right level of background noise; enough so that patrons do not feel as though others in the room can hear every word they speak to each other, but not so much noise that the patrons cannot hear each other across the table without raising their voices. Restaurants all too often suffer from noise levels that are simply too high. We have heard many times from restaurant owners who are looking for a way to bring the noise down to a more comfortable level, and always, they want something that does not mess with their expensive decor, or their sensitive budgets. With Acoustics In A Box™ products, we are happy to tell you that we now can actually provide you with just the solution you need to tame the excessive noise in your restaurant, and without having to shut down during the installation period (it can easily be done during closed hours), and without breaking the bank. Typical installations in a restaurant will run just a few thousand dollars, and sometimes far less, depending on size and other factors. You can also take an incremental approach: install a few panels and see if the improvement is sufficient. If not, install more until you either run out of places to put the panels or you get to the sound quality you want. We cannot guarantee that Acoustics In A Box™ sound absorber panels will completely solve your problem, but we can tell you that the addition of each Acoustics In A Box™ sound absorber panel, properly mounted using the patented black hole™ mounting system, will incrementally shorten the reverberation time of virtually any room. In general, the more panels installed, the shorter will be the reverberation time of the room and the better it will sound. In restaurants, Acoustics In A Box™ panels are generally installed on the ceiling in as many places as they can be fitted, using ceiling sloping panels with the included Black Hole™ mounts. The Acoustics In A Box™ system is quite simple to use, by design. The black hole mounts are attached to the wall or ceiling using drywall screws or adhesive, and the panels then install onto tabs on the mounts. Ideally, a 14' x 20' room would call for 8 panels, a room that would seat 25 people would need about 16 panels, one that would accommodate 50 people would need about 24 panels, and beyond that, a good starting place would be about 8 more panels for each additional 50 seats. See some small room configurations to help visualize a typical Acoustics In A Box™ installation. For your room, the configuration will almost certainly be drastically different, but these sketches may help. In virtually all restaurants, you will find natural limits to the number of panels you can install due to conflicts with doors, windows, artworks and other decorations and furniture. Furthermore, most restaurants value their walls especially because there are lots of windows and/or decorations on the walls that are integral to the ambience, and so rarely do restauranteurs allow panels to be installed on their walls. That leaves the ceiling though, and by using all the spaces available there, and choosing the appropriate color of covering cloth on the absorber panels, plus choosing the 2" thick panels, quite a lot of the potential benefit can be achieved with minimal compromises with the decor required. 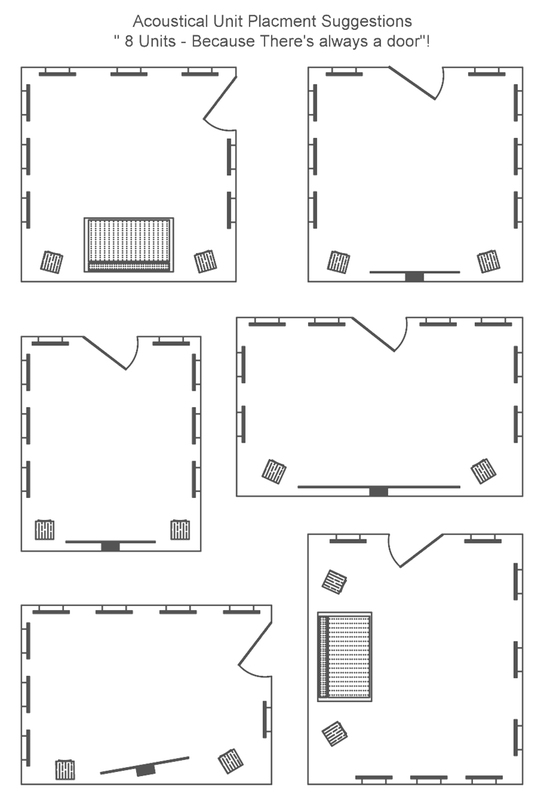 Accordingly, the most effective way to begin is to examine your room and identify the number of places you have where the 2' x 4' panels can be installed. If you can spare some wall space for panels, choose down sloping wall panels mounted so that the bottom of the panels are at about 6-7 feet above the floor, or if the room is not tall enought to accommodate this position, then mount the panels about 6 inches down from the ceiling. If you need more panels than you have room for, you can also substitute horizontal mount panels which you may be able to install above doorways or windows, and of course you may also be able to install additional panels on the ceiling. The more panels you can find room for, the shorter will be the reverberation time and the better will be the sound quality in the room. See Also: Acoustics In A Box™ Overview.